Everson Griffen was happy to take a seat during the third series of Sunday’s win against San Francisco, when all four reserves were subbed into the game at once. After all, Griffen is the one who played through plantar fasciitis in the second half of last season. It was no coincidence the Vikings’ pass rush fell from 2.7 sacks per game in the first half of the year to about 1.4 sacks per game through the end. So Griffen was happy to take a seat during the third series of Sunday’s 24-16 win against San Francisco, when all four reserves were subbed into the game at once. 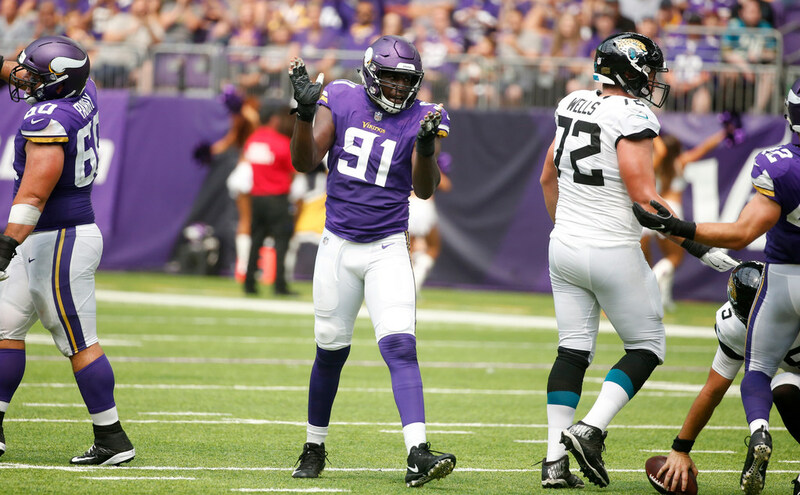 The “long haul” is the goal for the Vikings’ expensive and potent starting defensive line of Griffen, Sheldon Richardson, Linval Joseph and Danielle Hunter. Keeping them as fresh as possible late into the season — and, the Vikings hope, into January and Feb. 3 — is something head coach Mike Zimmer feels they didn’t do well enough last season for the NFL’s reigning No. 1 defense. Week 1 playing time showed the pivot. All eight active defensive linemen got into the game against the 49ers. That happened only twice all of last season. How they got into the game, however, remains a work in progress, according to Zimmer. At one point in the third series against San Francisco, the Vikings subbed all four reserves into the game at once. That type of ‘platoon’ sub isn’t what Zimmer wants, he said after the game. Getting the rotation down might take a few weeks, because Zimmer said he expects this Sunday in Green Bay to be difficult to get reserves into the game, since the Packers like to run the no-huddle offense with quarterback Aaron Rodgers.